Jef Wilson from East Rock Recording Studio made up some great shirts for ECPF … there are a bunch left over. Better scoop one up now. Only $6 $3 plus whatever shipping, etc. 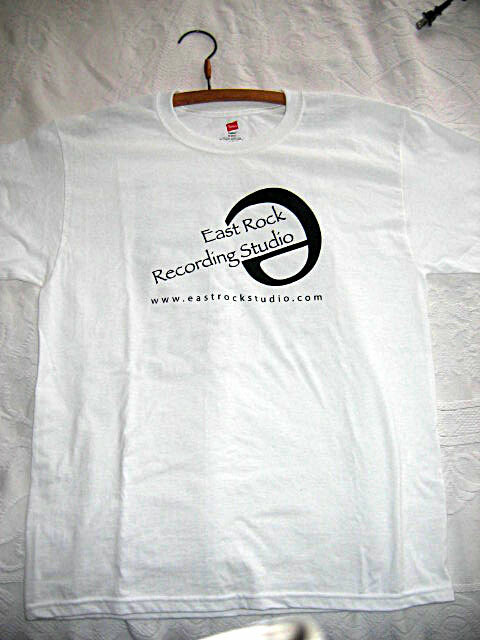 East Rock Recording Studio logo on the front. 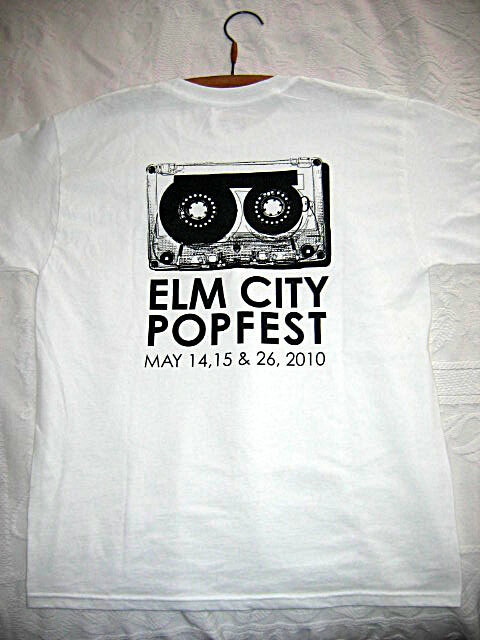 Elm City PopFest logo on the back. Click shirts for larger image. Elise and Jason are Bourgeois Heroes. The band began in the spring of 2002 on a roadtrip to Memphis. Once they arrived in Tennessee, they purchased a drum kit and an electric guitar and out to record their frst ramshackle single the following evening at Sun Studio. Since, the duo has released several handmade EPs that celebrate Friends-era Beach Boys production, an often Rhythm & Blues leaning and various “weird” sounds. Bourgeois Heroes is currently in a long distance relationship, communicating musical ideas between Austin, Tex., and Northampton, Mass. Their latest effort, the Musical Postcards EP, is a document of this arrangement. Demos and versions of songs at various stages were mailed by the post and feedback was often returned over the telephone or on the back of a postcard. The recording began at Jason’s home on a four-track tape cassette machine. Justin Pizzoferrato (Dinosaur Jr., Hush Arbors, Sonic Youth) engineered much of the rest of the work at Bank For Recording. Henning Ohlenbusch provided the baroque string arrangements at Rub Wrongways Studio. After these elements came together, everything was mixed down to a 2-track stereo tape, creating a homemade feel that contains both hi-f and lo-f sounds. Right, lets not mess around, Bourgeois Heroes are brilliant … ‘Musical Postcards’ is a bloody waltz. A lovely, string embedded baroque number with china fragile vocals and a pretty, ’60s-ish chorus. Really interesting, ambitious stuff. The deep, mystical vocals of Bourgeois Heroes would ft in very well next to a band like The Church or Echo & The Bunnymen or another similar melodramatic 80s group. While the Heroes hint occasionally at that sound on their release Musical Postcards, it also possesses the instrumentation of modern pop bands like Belle & Sebastian. And you can hear select other influences, as wide-ranging as The Pastels and The Zombies. The orchestral pop and wide ranging influences are a treat for the pop fan looking for clever melodies with whimsical character. The easy going strum of “The Boy At The Record Store” could be a theme of my childhood (sigh). The elaborate baroque “I Wanna Be Nice To You” is a period gem that fans of sunshine pop and The Kinks will be thrilled with. Overall an excellent EP that will brighten your day, so when is that full length comin’? It’s a collection of songs that have been worked on through the mail, through demos and postcards sent back and forth. It’s a very interesting concept, and the results are a bunch of shimmering 60s pop gems that make you feel good about your day. The album was recorded by Justin Pizzoferrato (Dinosaur Jr., Hush Arbors, Sonic Youth) at Bank Row Recording, which is probably why the sound quality is so great. Anyway, these are beautifully written tunes that wear The Kinks, Beach Boys and Beatles influences on their sleeve; which is a very welcome thing in my book. Musical Postcards, the new EP from Bourgeois Heroes, has a loping, melodic pop sound that reminds me of a combination of certain Belle and Sebastian singles, The Monkees, The Beach Boys (for me, the Beach Boys influence is especially strong on the last track, “Holly”), and Harry Nilsson’s songs for The Point (see this video for “Think About Your Troubles” or this one for “Me and My Arrow.”) … Elise and Jason’s collaboration is seamless & the vast geographical distance that shaped Musical Postcards leads to a gorgeous, intimate closeness. Listening to Musical Postcards feels like being very near to someone. Love a band that can sound retro sixties whilst clearly having their own original monicker, this is really charming music that will lift you up for the day. EDIT: July 23, 2010: Bourgeois Heroes interviewed by Brill Dream. The music begins tonight and doesn’t stop until Saturday at 11 p.m. You do not want to miss any of this line-up. The festival has a great mix of local, national and even some international bands. Boy Genius, Ray Neal, Veronica Falls, Steven Deal, The Wee Bees. Then … The Field Recordings, EULA, Panda Riot, Midstates & The Choir of Ghosts, The Fictional West, Roadside Attractions. Then … Butterflies of Love, The Secret History, Procedure Club. Then … just when you thought it was over it all starts up again on May 26 with Women’s Basketball, The Tyler Trudeau Attempt, Horowitz and Allo Darlin’. Seriously … don’t miss any of this. The Month of June is the musical outlet of Michael Murphy, formerly of the Connecticut noise-pop project Manchester By The Sea. Splitting equal time between Connecticut and New York City, The Month of June features collaborations with various musicians, including Brad San Martin (One Happy Island), among others. Taking its name from a line in Musical Youth’s “Pass the Dutchie.” The Month of June’s sole purpose is to fill the world with short, beat-driven pop songs — songs that aren’t scared to get happy, yet don’t shy away from sadness. The Month of June draws inspiration from the changing seasons, the natural surroundings of the Northeastern United States, love, loss, revenge and the intricacies of daily life. ‘Call It Art’ uses the vocoder, but Cher this isn’t. It’s an almost funky, fizzbomb of a song. A sort of indiepop drum ‘n’ bass, if you must. It’s also a perfect summer song. Go on, open the bus window and stick this on your new-fangled em pee three player. On the b-side, there’s ‘Daffodil’ – a more straightforward pop song, with a chorus that will accompany your every waking moment from now until eternity. There’s also a nice bit of trumpet from Brad San Martin of One Happy Island. I’d go as far to say that ‘Daffodil’ is the best song here. This is the first track on a superb debut single by The Month Of June who as far as I can tell are basically Michael Murphy who used to trade as Manchester By The Sea. This is the title track from his debut release as The Month Of June. The rest of the EP can be found at the February Records website.